There’s a new breed of human walking this Earth. The ever connected, technology addicted ‘smart’ person. We can answer phone calls and texts with our watches and glasses while our every move is collected and analysed by fitness experts. Much like Lewis Hamilton at Mercedes F1, we can now download our own telemetry for analysis. Although while we don’t get power curves and rear slip angles, we are keeping track of how far we’ve walked and how many calories we’ve burned. At the forefront of the human data logging efforts are Fitbit, these are the people who want to guilt you into going out for a run. Or maybe, at least walk to the chip shop instead of drive! 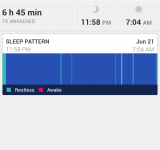 While the products that Fitbit build aren’t phones, they do have a handy app that I’ll bring in as the focus of this piece. 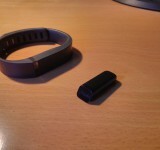 Fitbit are one of the industry leaders in this whole ‘activity tracker’ business. They build a range of products to suit different people, each serving subtly different purposes. The Zip is an entry-level device, aimed at children it has all the basic features you’d expect. 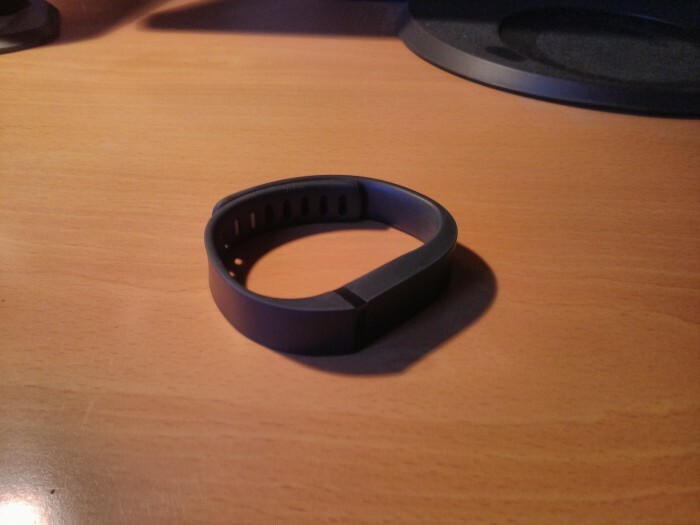 It will track steps, distance travelled and (estimated) calories burnt. The One will do all that, also tracking flights of steps climbed, sleep patterns and has a silent vibrating alarm to wake you. Finally the Flex, their latest product, will do almost everything the One can while being waterproof. However it lacks an altimeter so can’t count how many flights of stairs you climb. While the Zip and the One both clip onto your clothes (the One slips into a wristband at night for sleep tracking) the Flex is always worn on the wrist, meaning that apart from charging it never really needs to be taken off. This makes it what I like to refer to as ‘fire and forget technology’ because once it’s on, you don’t really have to think about it again. The final product they make is a set of smart scales, called Aria. Hooked up to your WiFi network it can automatically upload your weight to your Fitbit account making it easy to track weight gain or loss. 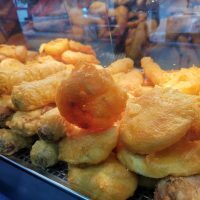 The scales can recognise up to 8 different users and keeps data confidential so you can keep those extra doughnuts a secret from your partner. So, all this data…what do you do with it. Well that brings me to the main point of this review, I wanted to take a look at the app. 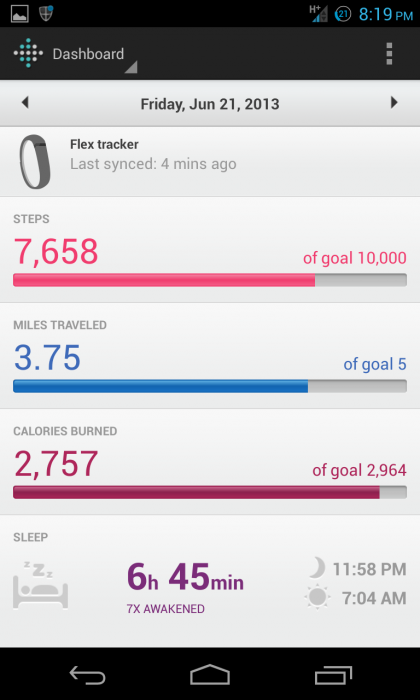 I have a Fitbit Flex. I saw it unveiled in January and pre-ordered it as soon as I possibly could. I love the fact that you don’t have to really remember about it because it’s always attached to you. Firstly I’d like to mention what the app is capable of and a few limitations that it has. 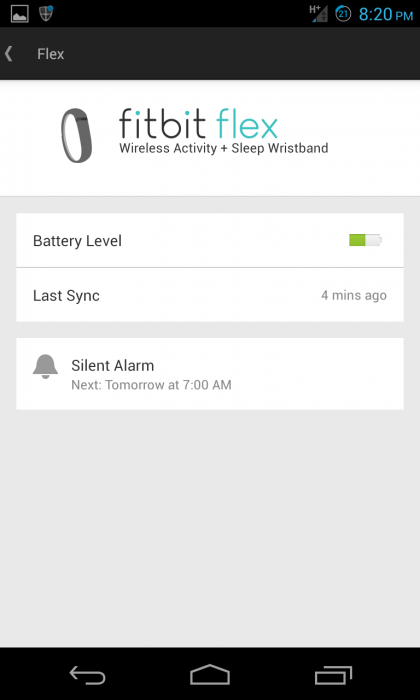 It’s primarily a great way to check on all your metrics throughout the day. 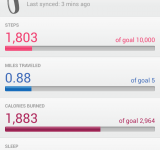 At a glance you can check your steps, distance and calories. 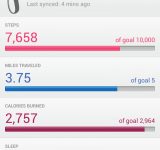 Going a little deeper you can find out about individual activities, these have to manually added or can be done so by apps like Runkeeper etc. 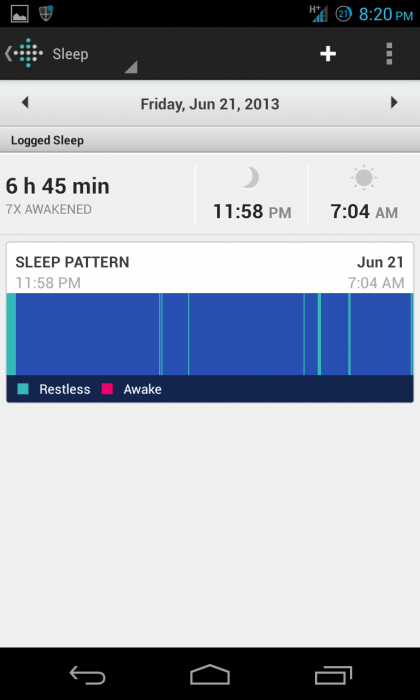 You can also add in your food and water intake and get a better break down of your sleep patterns. The apps settings leave a little to be desired. All you can change is push notifications or which food database you want to be accessing. I have that set to United States since, for some reason, the UK one still isn’t available. 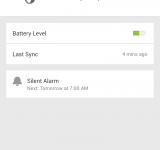 You can also set the silent alarm on the Flex from here, although once the settings have been changed you have to wait for your device to sync before the alarms become active. This brings me neatly into the main annoyance, my inability to get any real-time data, or any data for that matter when I’m away from my PC. The Flex and One will synchronise with a handful of Apple and Samsung products over Bluetooth 4.0. This functionality isn’t extended beyond these devices because Android doesn’t play with Bluetooth 4.0 (yet), so Samsung have built-in the functionality themselves. I understand the limitation, I just wish it would be rectified sooner. There is a Bluetooth 4.0 radio in my Nexus 4, why can’t that be made to work right now? Is it worth it? Yes, in my opinion. But it’s worth mentioning that this is because I am genuinely interested in this sort of product, collecting data and quantifying my life like this is something that I’ve wanted to do since I had a Fitbit One as a demo unit. To the casual shopper, this is a very hard sell, I’m not going to lie. 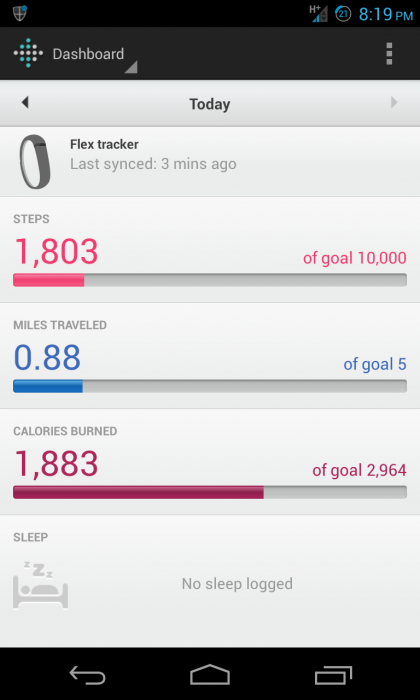 However, if you are looking for something to track your exercise this is a very good product. It does everything that’s required of it and does it quietly and without much thought. I almost forgot to mention of course that this isn’t a stand-alone app. 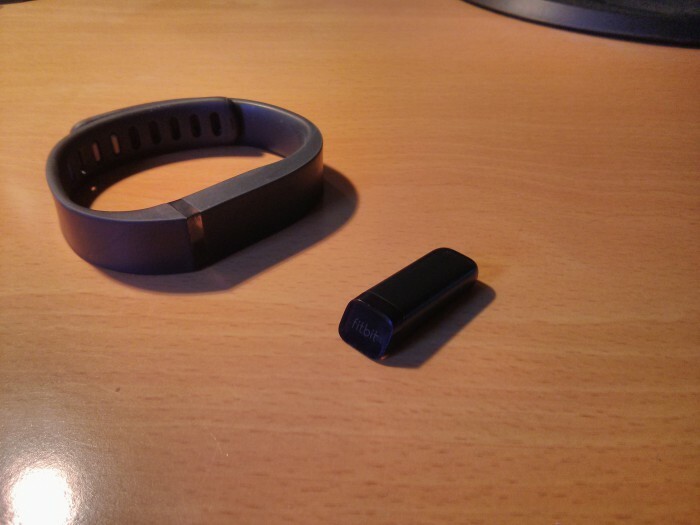 You will have to buy one of the trackers from Fitbit…! 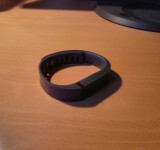 You can buy the Flex directly from Fitbit here.